Lowbrow Customs Drag Bars are CNC bent from 7/8" outside diameter tubing and are available in a black or chrome finish. 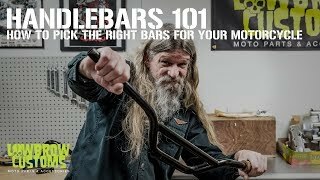 These drag bars are lean and mean with a 5" center width to keep the bars tight as you can to the risers, and an overall width of 26", and 2" of pullback for rider comfort. They work well on bikes with integrated risers and can also be used on taller risers depending on what riding position you prefer.